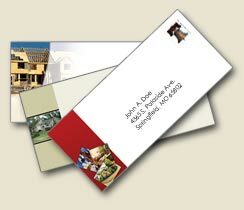 Full color envelopes help make even the smallest business look professional. Customize your own files for free upload or design your envelopes online with our easy and free to use design app. Prints are available in a wide range of sizes and cuts. Our custom envelope printing is eco-friendly, using soy-base inks which emit less volatile organic compounds (VOC) during our green printing process. A-1 ~ 5.125" x 3.625"
A-6 ~ 6.5" x 4.75"
A-7 ~ 5.25" x 7.25"
A-9 ~ 3.875" x 8.875"
A-10 ~ 4.125" x 9.5"
 Quantity Over 25,000: Additional business day per 5,000.